Editor’s note: Boukenred attended a screening of Snowden in NYC recently and this is his take on the event and the movie. The film Snowden is based on true events revolving around former NSA agent Edward Snowden, who leaked top-secret U.S. Government documents and data to the entire world in an attempt to call attention to clandestine global surveillance programs run by the NSA and Five Eyes Intelligence Agencies. The movie is directed by Academy Award winner Oliver Stone, who also introduced the film at its premiere. To help prepare audiences for viewing the movie, Director Stone staged a fun and humorous presentation on the screen about the dangers of cell phones, especially in movie theaters, and suggested that the audience silence their phones. This set the atmosphere for the film. 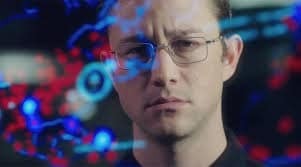 Starring Joseph Gordon-Levitt as Edward Snowden; the story focuses on what inspired Snowden to become an NSA agent during his early career, as well as what motivated him to become a whistleblower on U.S. Government surveillance activities, which is what the world knows him for doing. Throughout the movie, you are witness to Joseph Gordon-Levitt’s portrayal of Snowden as he transforms from being an obedient agent to the rebellious Edward Snowden the world knows today. While this may be a controversial role for Gordon-Levitt to play, the narrative progression of his performance proves to be suspenseful enough for the viewers to enjoy. Throughout the entire movie the focus is all on Gordon-Levitt’s character, to the point that other major stars such as Scott Eastwood, Zachary Quinto, and Nicholas Cage are merely forgettable throughout the entire film. Other than Snowden himself, the only major character role for this movie was played by Shailene Woodly, who plays Snowden’s love interest. Her dynamic performance with Gordon-Levitt is the most significant impact on Snowden’s personal life during the aftermath, which allows the audience to feel sympathetic for the main character. While this movie may hang solely on Gordon-Levitt’s performance, it is satisfying enough that he keeps the movie together. This draw of the film is the controversy behind Snowden’s actions and government surveillance, which should entice many, however the movie itself can actually feel dragged out. The focus of the narrative of the film can be difficult to sit through, while the eventual pay-off didn’t deliver to expectations given the time the audience must invest in watching. It could be that the events of the true story did not play out well enough to keep the viewers’ attention, or it could simply be the case that the truth of the story may actually be stranger than fiction. Overall, the movie may not be an interesting subject for a broader demographic of audiences due to its controversial subject matter. The performances of Joseph Gordon-Levitt and the rest of the cast can be considered fair. If you’re looking for a suspenseful movie, this movie may disappoint, or you may simply not find it worth the time to learn more about Edward Snowden. In the end, Snowden is a movie that glorifies Edward Snowden as a protagonist, with the U.S. government being the antagonist of the movie, and as such may prove to be a film that viewers may not enjoy — and perhaps avoid.